A revolution was scheduled for 1984 – the F1 and Endurance championship formulas would be cut from 1000 to 850cc. The manufacturers made their preparations, and Honda made use of the run-up period to develop its V-four concept. A 1025cc prototype FWS ran at Daytona in 1982, but it was an RS 850 that achieved success in 1983, with Joey Dunlop winning the F1 TT title. Made intermittently by HRC (Honda Racing Corporation), this 850 was derived from the series-production VF750F launched in 1982. But it had a 75mm bore (instead of 70mm), and the camshaft drive was no longer by chains but by two trains of pinions, a technique later used on the series-production V1000R and VFR750. It also differed from the original in having the oil tank mounted beneath the engine. A similar machine was successfully tested in endurance racing in 1983. 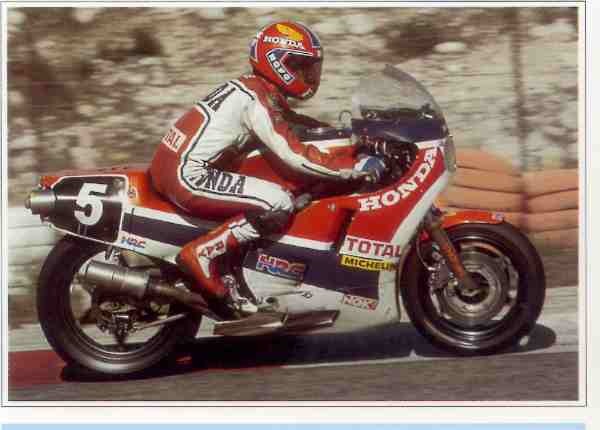 And to everyone's surprise, it won the Bol d'Or, ridden by Roche, Bertin and Sarron. It was subsequently developed in 930cc form, a move forced by the pressure from the 1000cc Suzuki and Kawasaki. In 1984, Honda would be ready to regain its titles, thanks to the RVF750, not only in the F1 TT with Joey Dunlop but also in Endurance with Igoa and Coudray. By preparing its ground two years ahead of time, Honda had stolen a march on its rivals, whose brand new 750s would take at least one season to shake down. Originally built with a round-tube steel frame, the RS 850 soon gained a frame in square-section aluminum tubing and won the 1983 Bol d'Or with an engine bored out to 930cc.